Let me guess. As an average user of a smartphone, you have probably dozens of apps. Every day, you spent a generous amount of time on different apps, either going on social media platforms, checking the latest news from all around the world or just making a quick bank transfer through your bank app. 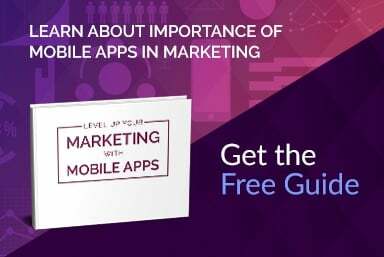 At the moment the mobile app market is huge, nonetheless, it is still expanding because people want to make their lives easier...or we just simply enjoy being pampered by an increasing number of eye-catching mobile apps. With the expansion of the digital world, mobile apps became vital for everyday users of smartphones and firms that relay their business on it. We can notice how the mobile app market has been changing in recent years. 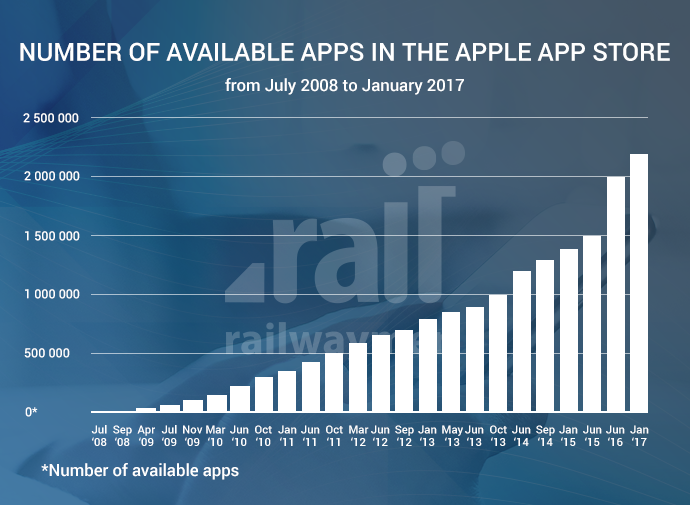 The statistics of the number of available apps in the Apple App Store from July 2008 to January 2017 confirm that. As it is evident from the above graph the number of available apps has increased significantly. For instance, from 2013 to 2017 the number of available apps amplified by more than 1 million. It is important to understand the significance of the mobile app market for users and firms. More businesses decide to develop their own app to meet the needs of their customer and enhance their engagement and loyalty with them. The number of new smartphones in the world correlates with the tremendous number of apps available on several market apps. In fact, almost every user activity has shifted to mobile. However, it is vital to point out that the graph only shows the data from Apple App Store. Google Play Store where users have a broader range of choices of apps also needs to be taken into consideration. Almost every firm that is operating online at some point should consider the advantages of having an app and how ROI indicator can be rapid and effective. 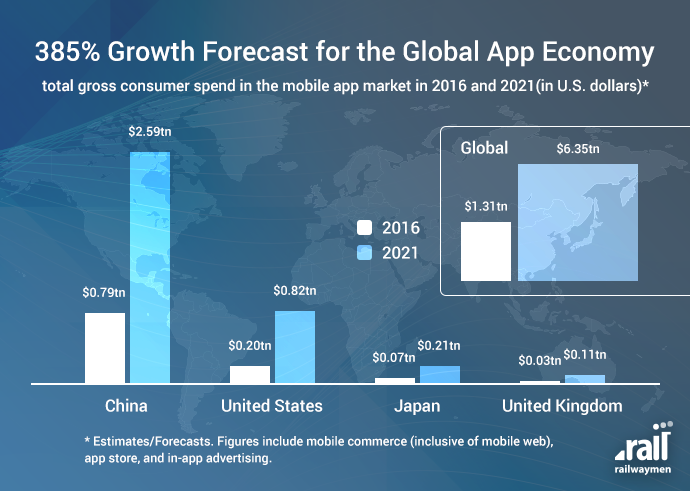 In 2020 mobile apps are expected to make 188 billion U.S. dollars in revenues. It shows us how the market is constantly-growing and how the fact of having an app might be beneficial for a business. We can observe some changes in the mobile environment and in the Global App Economy - consumers are willing to spend more money on mobile apps. In 2016, the amount that was spent on mobile apps was $1.3 trillion and it is forecasted that in the following 6 years it might increase to $6.35 trillion. It seems mobile apps are tremendously important for people and its features have great implications for satisfying specific market needs. You should encourage and accelerate the growth of your business, otherwise, you will be lagging behind your competitors. Remember, the fact of having an app does not mean your business holds a competitive advantage or suddenly client's productivity or client's engagement increases. The quality of the app must be flawless, crafted by highly-qualified specialists who will transfer your business needs to the app. Generally, the cost of building an app might be different according to app’s features, complexity, the type of platform and human resources (in-house team, outsourcing of software house or freelancer). It is important to have a good plan and enough budget for an app. Even the slightest change of the app's detail can lead to a huge rise in the production cost. If you are considering to build an app, careful planning and a thorough research need to be carried out beforehand. Let’s say the cost of MVP - the simplest and ready to launch version of an app – is about $5,000-$15,000, but the addition of extra features can boost the cost up to $250,000 or even more. This amount seems to be an average for all mobile development processes. Of course, we should take each case individually because the cost of some features may differ according to the purpose of the app. Remember, MVP is the most basic and simplest version of an app, which later should be developed constantly. Your MVP might be acquired by potential investors or you can find possible co-founders to improve and develop your app into a more complex and advanced one. Push Notifications - it is a message that pops up on a mobile device (smartphone, tablet, etc). We can get the notification from the app publishers at any time. We are receiving them without ever being an active user of an app or using its devices. Rating Reviews - every customer should have a possibility to share his own thoughts and comments about an app. Actually, that is entirely helpful for the app provider in order to become aware of drawbacks and improvements which must be considered and implicated. Let your customers be an important part of your app development process! Native Integration - when the application program has been developed for use on a specific platform or device then we can call it “native app integration". Building an app dedicated to a particular platform is more complex, takes more time, but the final effect of an app development process will be satisfying. Web Portal - building a web portal is an expensive feature. Of course, it helps with the management and promotion of an app, but it requires complex coding and back-end integration. Performance Management (application performance) - It is all about user's perception and how they rate an app performance. The app performance is measured by the speed of starts up, how responsive the app is or how it uses the device power. In the next part, we are going to consider the process of an app development step by step and general cost. You will learn about native and hybrid apps. Finally, you will know who is going to build your app.